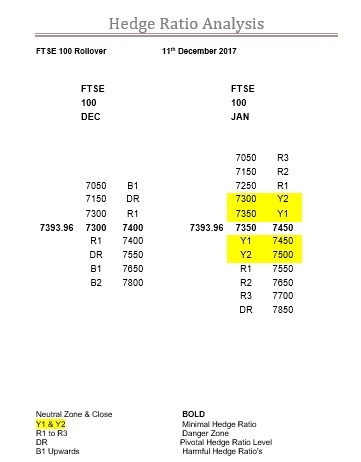 We have to give the FTSE credit for trying at least, and it was right on cue in the last hour peaking at 7412.21, but ending in failure as they remain inside their zone. From the format used here one can tell it is the rollover and in the mighty Dec things can get quite excitable as derivative inspired equity activity ratchets up several notches so everyone always wrongly attributes this, which can be self-perpetuating. However, judging by the derivative activity, and this level in any other expiry it would be nearer the top of the scale, reflects disinterest, as this is essentially a lot of money coming off the table. December expiries are always tremendously difficult to call, for the very reasons mentioned above, but with just a couple of days to go and with this type of activity it could just be a boring one. So, how did we do in our forecast, and here’s what we said “We would like to say it will stay inside its zone, as it has been doing more or less for the last few expiries. But therein lies the issue as we believe at some stage, probably towards this expiries rollover, 7450-7550 will have another go at being the NZ, which would change everything entirely”. The rollover is on Wednesday so the jury is still out on 7450-7550, but in respect of the rest of it we are more than happy with that. The first week was quite aggressive but it never closed more than a few points above its upper boundary, and since then it has had just the one close outside, being 7460.65 on the 28th November, so where short term index forecasting is concerned that is as good as you will get. For the first look at January and one is immediately struck by how much smaller it is, although it perhaps looks busier as there are more levels on show. One of the other main differences is the NZ’s are out of sync, with this one being just a smidgen higher. The common denominator across the two is 7350 to 7400. Another stand out feature is the return of a decent amount of Y ratio, which will hopefully allow this index much more freedom to move outside its zone. Our forecast for this expiry is next Monday of course. SPX outmuscled, NDX hard fight and DJX big bounce off R3 at 24100. Today’s levels.